After beginning their training in 1976, on September 1, 1977, the first Paramedics took to the streets in south King County. Highline Medic One operated under the administration of Highline Community Hospital and King County Fire District #2. Their medical director was Dr. Block, a Cardiologist in the 70’s who recently retired and still sits on the board of Valley Medical Center today. This medic unit was stationed inside the present-day Kent Fire Department Station 47, which at that time was a District 2 volunteer station. Valley Medic One operated under the administration of Valley General Hospital and their medical director was Dr. Gerald Lorch, who also practices Cardiology in King County today. This unit was quartered at Valley General. While Valley and Highline Medic One were forming, the Auburn and Federal Way Fire Departments both vied for a medic unit of their own. Many options were discussed and a resolution was met in late 1977, forming Auburn / Federal Way Medic One. This third medic unit in south King County went into service in early 1979. Their first medical director was Dr. Patrick (Jack) Regan, an innovative interventional cardiologist. Auburn/Federal Way Medic One served Auburn and Federal Way, and they even responded to Crystal Mountain, parts of Pierce County before paramedics were available there, and Mt Rainier National Park. The early days of Medic One were tenuous. Paramedics were a brand new phenomenon and not everyone thought the phenomenon would last. There were obstacles and new challenges to overcome on a constant basis. Funding was in short supply. The original Medics held bake sales, did photo ops at local businesses in exchange for donations, and attended a grand opening of a hair salon in Federal Way. The local Rotaries, Volunteers of Valley General Hospital, and Robert Wood Johnson Foundation (and many other civic organizations) were big supporters in the early days of our Medic program. Some of the early Paramedics lived in regions of the county that did not have access to paramedics and they volunteered in their communities to be on call as paramedics on their days off – places like Issaquah, Carnation, Enumclaw, Duvall, and Vashon Island. Paramedics were also involved in continuing education for EMTs and Fire Departments before there was a county-wide training program. Today, King County EMS fills this role with assistance from KCM1 paramedics. Our Paramedics helped create the first criteria-based dispatching for the dispatch centers in south King County. Before technical rescue was commonplace in the fire service, Keith Keller (a founding member of Auburn/Federal Way Medic One who is still working as a KCM1 paramedic) operated Rescue One, a technical rescue unit based out of Enumclaw that served much of the south end. These early trail-blazing Medics paved the way for the modern and world-renowned system we have today. Original Medic 5 Paramedics: (L-R) Chief Farrell Wilson, Randy Bellon, Lee Frykholm, Bill Marsh, Dennis Doherty, Roy Soper, Tony Scoccolo (MSO 1990-Present), Stew Crandall, Don Flacher, Mike Hansen, Dr. Gerald Lorch. 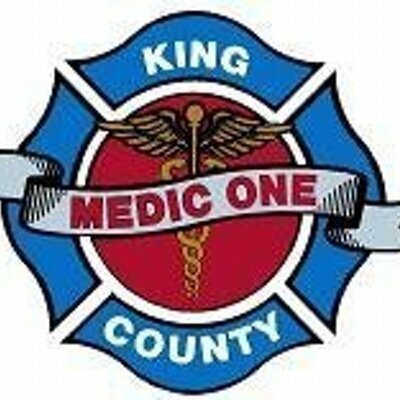 In 1980, the original three Paramedic groups (Highline, Valley and Auburn/Federal Way) merged into the present-day King County Medic One, under the EMS Division of Public Health Seattle – King County. The first Medic One/EMS Levy also passed that year and finally provided a stable source of funding for the department. To handle the huge need, an additional Medic unit was brought online in 1981. Over time, this Paramedic phenomenon took root. Additional Medic units were staffed in Kent and Covington in 1992 and 1996, respectively. A Medic unit was staffed to provide service to Ravensdale, Palmer – Selleck, and Enumclaw in 1998, but it was only half time until it’s full implementation in 2003. Our 8th Medic unit was placed in fulltime service in Des Moines in 2010. The strength of our people and the drive to help our citizens is what got us started almost 40 years ago, it is what sustained us over the decades, and it is what still steers us today. It is an honor to continue to serve the citizens of south King County and we appreciate your trust in us! February 2, 2016 in Our History.